When concussions happen most if not all of the concern and treatment is focused on the brain injury. However, with EVERY concussion the person will also have a corresponding neck or cervical injury. 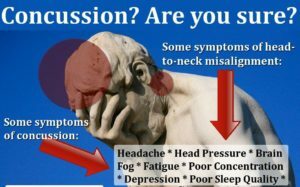 Often times the symptoms of a concussion overlap with the related neck injury. Chiropractic care is focused upon the diagnosis and treatment of the cervical neck injury. Often times a players return to sport activity or normal life is delayed due to improper treatment or no treatment of the related neck issues. A study was published in the January 2018 issue of the Journal of Clinical Chiropractic Pediatrics documenting the improvement of concussion symptoms of headache, poor concentration and photophobia in a young boy who had suffered a traumatic accident days earlier. Sometimes called mild traumatic brain injury (mTBI), the authors of this study used both these terms interchangeably to describe the same condition. According to the U.S. National Library of Medicine’s Medline Plus website, “A concussion is a type of brain injury. It involves a short loss of normal brain function. It happens when a hit to the head or body causes your head and brain to move rapidly back and forth. This sudden movement can cause the brain to bounce around or twist in the skull, creating chemical changes in your brain.” Estimates of the number of concussions range from 2.5 to 3 million cases each year in the U.S. alone. The U.S. Centers for Disease Control list a number of symptom and danger signs associated with concussion. They include headache that gets worse and does not go away, weakness, numbness or decreased coordination, repeated vomiting or nausea, slurred speech, one pupil larger than the other, convulsions or seizures, or a loss of consciousness. In this case, a 13-year-old boy was brought by his mother to a chiropractor in Auckland, New Zealand. The boy was suffering from a variety of symptoms related to a concussion. Five days earlier, he had suffered a skateboard accident where he had hit his head. After his fall, the boy was unconscious for 30 seconds. The boy also was suffering with a headache, a decrease in his concentration level, a moderately sore neck, and increased sensitivity to sound and light. His head pain would increase when he walked or laughed. An examination was performed which revealed an increased sensitivity to light as well as a decrease in coordination. Static palpation, motion palpation, and spinal examination procedures revealed the presence of subluxation in the boy’s spine. Specific spinal adjustments were started to address the subluxations. According the study, the boy reported significant symptomatic relief after the first visit. These immediate improvements included improved concentration as well as less sensitivity to light. After his second visit, he reported that his headache was no longer constant. Over the next several visits, the boy reported improvement in all symptoms and stated he was “feeling freer.” His condition continued to improve so that by the eighth visit, he reported a complete resolution of all symptoms.